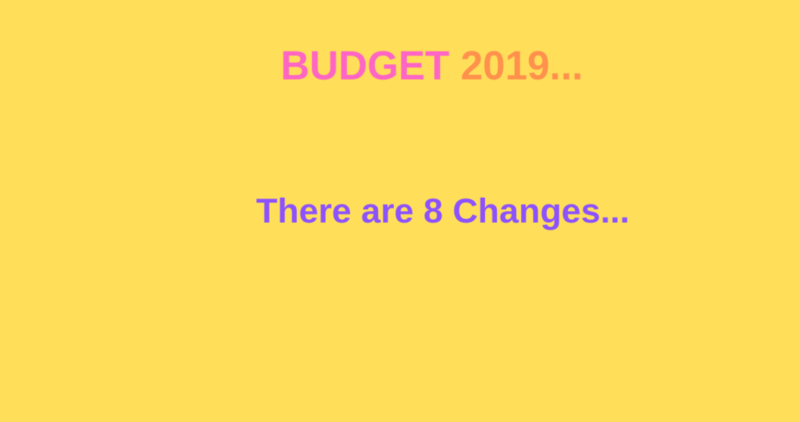 8 changes in Budget 2019 are very important to us to know. The Highlights are explained below. Your tax liability is zero if your taxable income is 5 lakh. However income tax slab not changed in 2019 Budget. If you see above table there is no change of Income tax Slab. But how your income up to 5 lakh is tax fee? The reason for 5 lakh income is tax free because earlier section 87 A giving tax deduction up to income of Rs.3,50,000, and the deduction amount was Rs.2,500. Now the income exemption under section 87 A has increased to 5 lakh and the deduction is up to Rs.12,500. However, if your taxable income after all deductions is less than or equal to 5 lakh. Then there is no need to pay any tax. You can read the article about Section 87 A for Budget 2019. Click here to read. Read to know the 8 benefits for Filling the Income-tax Returns. Click here to read. 2. Pensioners and Salaried Can claim Standard deduction of Rs.50,000. Earlier this deduction was only Rs.40,000. Now it is increased to Rs.50,000. This deduction is given replacing medical expenses and transport allowance which were there prior to budget 2018. Earlier TDS applicable to Bank Fd and Postal Fd once the interest amount crosses Rs.10,000 in a Financial Year. Now TDS will be deducted only when the interest amount from Bank Fd and Postal Fd crosses Rs.40,000. But do not forget TDS not there means that you do not need to pay tax. The interest from Bank Fd and Postal Fd is still taxable just like earlier. This scheme is launched for the unorganized sector workers with monthly income up to Rs.15,000. The scheme will provide assured pension of Rs.3,000 monthly from age 60. But the workers need to contribute a nominal amount while they are working. An organized sector who joins in this scheme at age 29 should contribute monthly Rs.100 to wards this pension scheme. Government also will contribute an equal amount towards this pension scheme. Government is expecting at least 10 crore unorganized workers will join in this pension scheme, and after 5 years this will become worlds biggest pension scheme. Lets take an example if person joined in this scheme at age 30 years and he will be getting pension of Rs.3,000 after 30 years. If we assume the rate of inflation is 6% all these 30 years, then the Rs.3000 is equal to Rs.522 today. But how many people can survive with Rs.522 per month these days. This scheme is not at all good. Instead of this Government should educate people to save in NPS etc to plan for their retirement. 5. Income Tax returns and refunds will be processed within 24 hours. This is big Technological move by Government. All returns will be processed with in 24 hours and refunds will be processed in next 2 hours. This will be done with automated back office. There will be no personal interaction with tax payers and Tax Officers. Earlier income tax is charged on the notional rent of 2nd self Occupied House. Now keeping the difficulty of people having to maintain two houses for parents and self at two different locations. Government decided to stop charging the income tax on the 2nd self occupied House property. Earlier if you are paying Rs.1,80,000 as rent, you need to deduct the TDS and pay the rent to the owners. But now this limit is proposed to increase to Rs.2,40,000. Under section 54, you have to invest in single property to avoid the capital gain tax. But now you can invest in two house properties your capital gain up to a limit of 2 crore. You can avail this benefit once in life time. Read article about what is new pension scheme and how to join in it?. Click here to read.